Holstein Bulls can weigh over 500 lbs and grow to be almost two yards in height. Although Holstein Bulls look clumsy and sedate, they are extremely agile and nimble. Holstein bulls can effortlessly jump over pasture fences. Before two Holstein bulls fight, they stare at each other aggressively. �The first one to look away loses�, as the saying goes. It doesn�t happen often, but if neither of them gives up, then they fight. In that case, the bulls charge at each other on the pasture with lowered heads and ram each other. Even if the ground is a little muddy, the bulls always find firm footing when they fight. This is due to their claw-like hoofs, which consist of two toes that dig firmly into the ground. 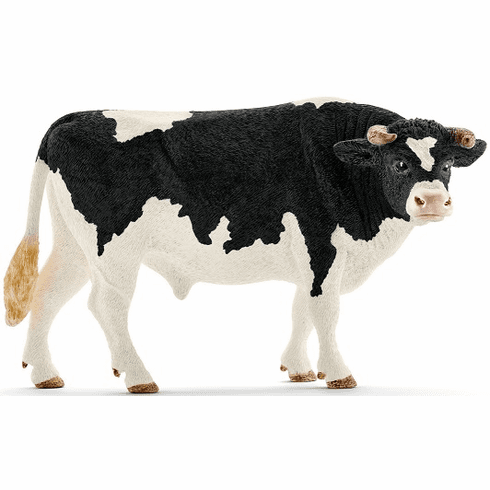 This Schliech Holstein Bull measures approximately 5 inches long by 3 inches tall.